This past weekend took FFPA out to central PA for PA TU's first quarter Executive Committee Meeting in Bellefonte. Yup, that is right! We braved the 'Day After Tomorrow' weather predictions. And so did a few other intrepid TU folks. It was great meeting the many faces behind the scenes at PA TU. It appears our presentation was well received and we have the endorsement of TU. They are backing our efforts to get cold-water releases from FEW. 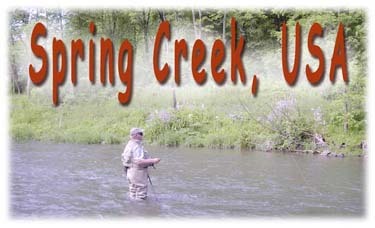 Of course we cold not make a trip to the banks of Spring Creek without making a few casts. I do not know which was more exhausting - traipsing thru the snow or trying to get my waders on over about 5-layers of fleece. Mobility was not a priority. Obviously conditions were tough, but we did have a few fish hit our flies - none of which were landed. Small beadheads did the trick. We would like to announce that we'll be giving our Lehigh River Presentation at this year's TCO Spring Party - March 19. We hope to see you there. As we said before we have some really cool facts, figures, maps, pics and handouts which back our ideas on how the Lehigh can become one the best tailwaters in the East - a 21st-Century trout stream. We think you will find it quite informative. Check back from time to time for more updates. We are pleased to announce that according to the Army Corps of Engineers there is to be a public forum meeting sometime in February to discuss the future of the Lehigh. At this time we do not know the date, but keep checking back for more. This has been a long time coming, and it is about time the stakeholders - you and I - can voice our concerns and vision for this river. 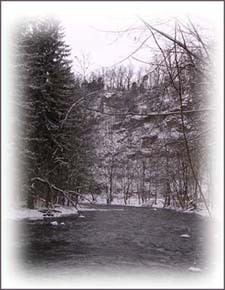 Also, on a related matter - Fly Fish PA, on behalf of the Lehigh River Stocking Association - Watershed Committee, is giving a power point presentation on the saga of the Lehigh to PA TU at their first quarter Executive Committee Meeting out in Bellfonte - Jan 22. We invite all to attend as we have some really cool facts, figures, maps, pics and handouts which back our ideas on how the Lehigh can become one the best tailwaters in the East - a 21st-Century trout stream. As you may know, this river has quite a history! It is also a relatively unknown fishery, and has immense potential. Our goal for the presentation is to provide awareness of this much-maligned fishery and as a result of this meeting we hope to generate a solid flow-plan that can be presented at the public forum...this plan will be endorsed by TU and will strictly look at what is needed flow-wise from FEW to create a fantastic wild-trout fishery extending all the way thru the gorge and beyond. There are already some great minds working on this....so it is just a matter of finalizing this plan. Take a look and see what a Lehigh Float is all about!! I tell you what! If these flows continue like they've been - we just might have to bust out the Clack on Penns this spring to fish it effectively!!! 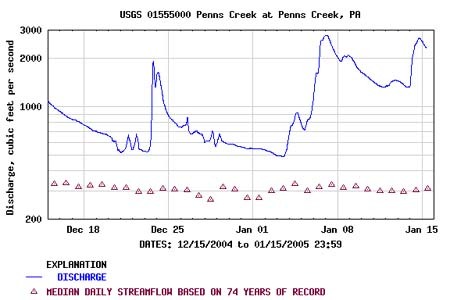 Relax...we are just kidding, we would not do that...but if you have any doubt about the amount of water currently in the ground and streams - then take a look at the chart at right - from Penns Creek, PA.
And now that we have some colder air moving into the area for the forseeable future the higher than normal flows ought to do a really good job at keeping water temps somewhat more elevated than the flip-side scenerio - low-flows. This just might keep the fish a bit more active, incase we get that little window of nice air temps and you decide to hit it.